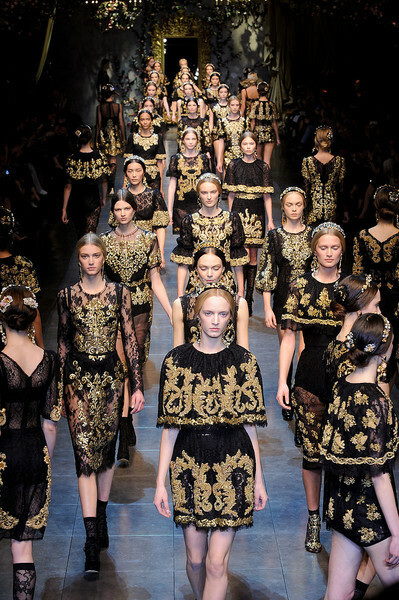 Dolce & Gabbana’s Fall 2012 collection was undoubtedly one of my favorites of the season. The black and gold baroque-inspired dresses and separates were literally awe-inspiring and are slowly becoming a celebrity favorite for red carpet events. Selena Gomez stepped out in one of the collection’s designs at the photocall for her new film, Spring Breakers, at the 69th Venice Film Festival. She paired it with Jimmy Choo Lance Strappy Sandals. Perfection! Her strappy sandals are one of the brand’s most-coveted pairs and a red carpet staple. They feature double buckle fastenings and 4.3″ metallic heels. Jimmy Choo’s Lace Strappy Sandals retail for $621. Visit www.farfetch.com to purchase and www.jimmychoo.com for more information. See Selena’s dress on the runway below, worn by Sigrid Agren. *Images courtesy of Getty and ImaxTree.